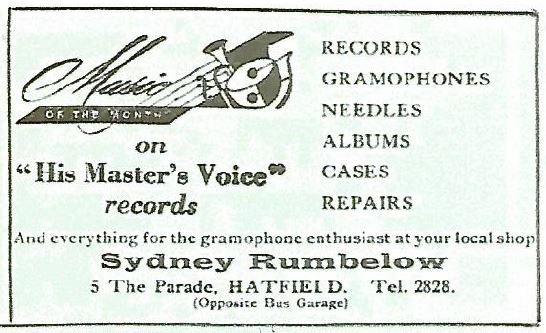 1952 advert from the programme of Hatfield Town F C, focusing totally on the provision of music. My earliest recollection of the shop is of a window-display featuring a length of cloth, probably velvet, draped over an item of furniture on which was placed a violin and a bow. 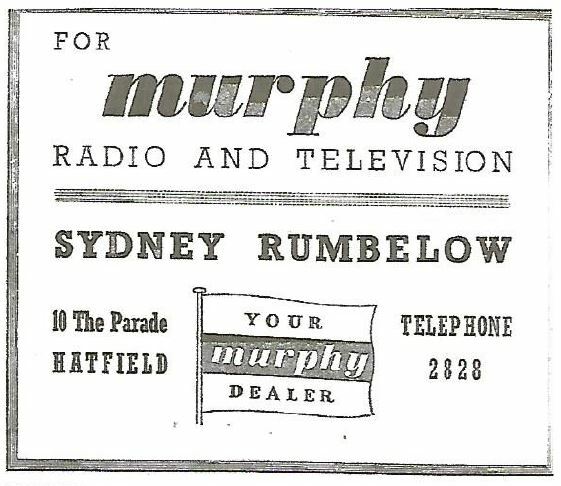 Sydney Rumbelow was born on 19 September 1909, the youngest child of Charles Rumbelow and his wife, Elizabeth. Young Sydney spent his early life, along with his two older sisters, May and Millie, at their home at 2 Batterdale, a row of cottages very close to the Great North Road in Old Hatfield. At that time, his father was employed as a painter with The Great Northern Railway, one of the major employers in the town. Sydney received his early education at the school at the top of Church Street (now the Church Hall), though it was then known variously as Hatfield Church of England Elementary School, Countess Anne’s School or possibly St Audrey’s. He displayed early academic ability by obtaining a Governors’ Award to Hertford Grammar School in 1921. This was a considerable achievement in those days, soon after the end of the First World War. He continued his education there, most probably travelling daily to Hertford by train on the branch line from Hatfield and remained there until the end of 1924 when he left to take up a clerkship, most probably with an Insurance Company in London. 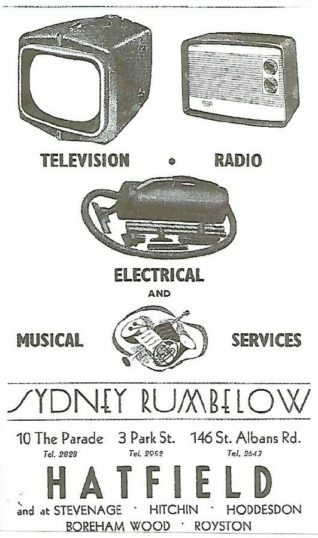 One can only wonder how committed Sydney Rumbelow was to office life but it is clear that he displayed considerable talent as a musician and was a regular member of St Audrey’s Evening School Orchestra in the late 1920s and 30s, as one of their violinists. 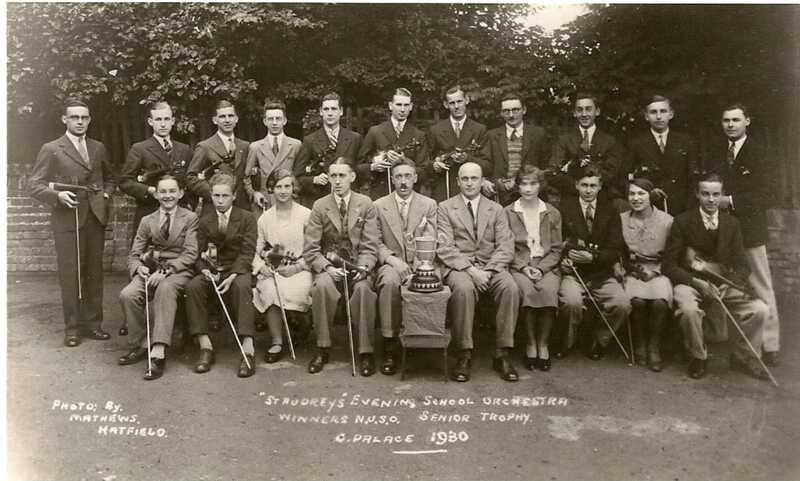 This orchestra built up a healthy reputation, not just locally, as they were regular participants in the competitions of the National Union of School Orchestras and on several occasions were trophy winners at their annual events at the Crystal Palace. With a growing reputation as an “accomplished violinist”, Sydney played with other orchestras and it is reported that his appearances included at least one with the Bournemouth Municipal Orchestra which was broadcast on the BBC. That was, of course, in the early days of broadcasting when the ownership of a wireless was still something of a novelty. At some time, probably in the late 1920s or early 1930s, the Rumbelow family had moved from their cottage in Batterdale to one of the recently built houses in Cecil Crescent. 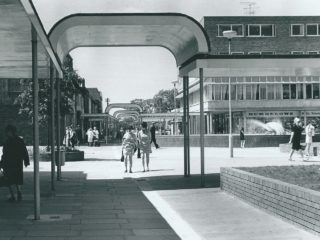 Little is known of Sydney’s working life at that time but, following his marriage in Hatfield in 1938, he and his wife Vera moved to Welwyn Garden City. 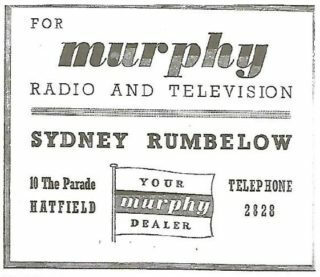 Having been assessed as medically unfit for military service, he spent the war years working at Murphy Radio. He also served in the Home Guard and jokingly boasted that he was assigned to guard Welwyn Viaduct. 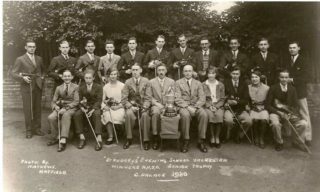 It was during the War that he formed his own orchestra and for a number of years they were a popular attraction at various local dance venues including The Cherry Tree and The Parkway Restaurant in Welwyn Garden City and at the Public Hall and the Red Lion Hotel and Cranborne Rooms in Hatfield. Throughout the 1940s and 50s, he was also in demand with other orchestras, performing principally as a violinist though he was well-equipped to fill in on other instruments when required. He became well-known at numerous local theatres and halls including The Barn Theatre where he later became the musical director. 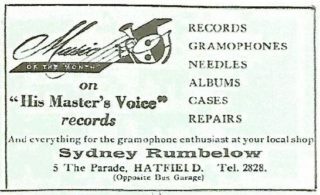 A major development in Sydney Rumbelow’s life took place after the end of World War II when he took a job as manager of a music and record shop, believed to be W J Elliott Ltd., who were based at 45 Howardsgate, Welwyn Garden City. He did not remain there long but it provided him with the incentive to begin his own business in the music field. He achieved this by opening his own shop at 5 The Parade, St Albans Road, Hatfield in 1949, just around the corner from his former family home in Cecil Crescent. He chose an ideal time for this move as radios were very popular, television was in its infancy and gradually more and more electrical goods were becoming an everyday part of the modern home as wartime restrictions were lifted and the country moved into the 1950s. 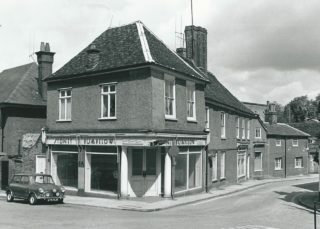 He soon opened another shop in Old Hatfield at 3 Park Street and moved from his small St Albans Road shop to a larger corner unit at 10 The Parade. 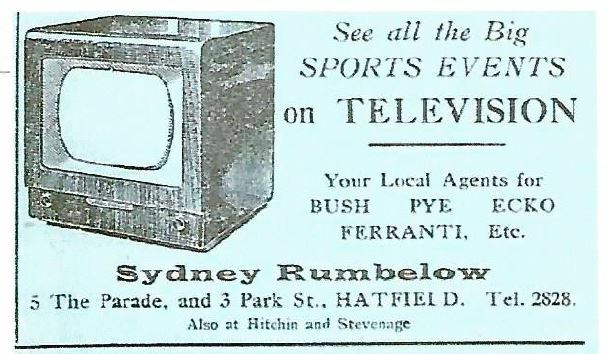 Over the following decade, the Sydney Rumbelow name began to appear in a number of other towns throughout Hertfordshire including, Hitchin, Stevenage, Hoddesdon and Boreham Wood. 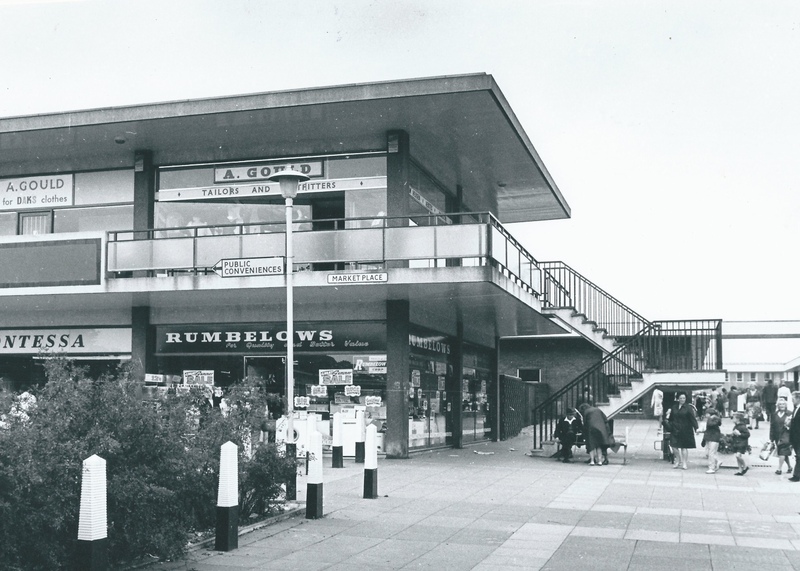 Throughout this period, he also opened other shops in Hatfield including one near the cinema and, when the new town was developed, there was a prominent Rumbelow store on a corner site in White Lion Square. His considerable workforce also operated from a servicing workshop, which by coincidence, was located very close to his birthplace in Batterdale. He was by now a prominent local businessman and played a full part in the community as a Hatfield Rotarian, as President of the Hatfield Chamber of Commerce in 1954 and as Chairman of the Radio and Television Retailers Association (R.T.R.A.) in the following year. By the mid 1950s, the effects of the war and the austerity that had become part of daily life were easing and the country was moving towards better times as our Prime Minister told us that we “had never had it so good”. This was certainly true of Sydney Rumbelow who was building a successful business and opening more stores. It was also reflected in his private life as he and his growing family moved from their home in Fordwich Road to a larger property in Guessens Road in Welwyn Garden City. This was also a period when the range of domestic electrical equipment at affordable prices was expanding at a rate that had never previously been envisaged. Businesses like the Rumbelow shops in Hertfordshire had sprung up throughout the country to satisfy this unprecedented demand and with the introduction of hire purchase and rental agreements, this growth continued. The number of relatively small electrical retailers expanded across the country and business boomed but they were experiencing new problems with regard to their ability to maintain the necessary range of stock, with numerous manufacturers producing their own models and the prospect of new products such as colour television on the horizon. This led to the need for consolidation among many of the small firms but, in the harsh world of business, there are inevitably big beasts lurking in the jungle, waiting to pounce. One such company was Thorn Electrical Industries who began buying up several small electrical traders during the early 1960s. Sydney Rumbelow initially agreed to the sale of 75% of his business to Thorn as a first step and remained with the company, though his new role is not clear. What is known is that he was not totally at ease in this role and, within a year or two, he sold the remaining part of his business to Thorn and severed his connection with them. 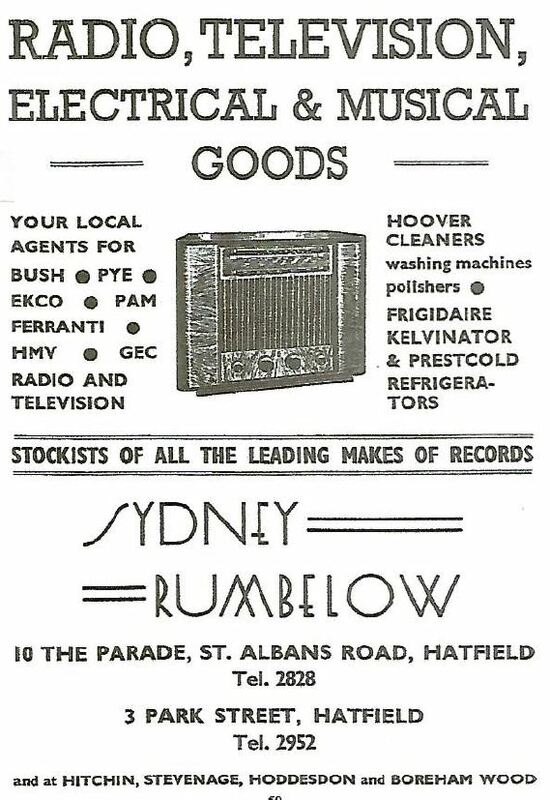 Since Sydney had always had a deep interest and love of music, coupled with his many years of experience in the electrical retail business, it is not surprising that he soon bought a shop in North Finchley selling sheet music, records and other electrical goods. He happily continued in this line of business until his retirement and subsequent death in June 1974. 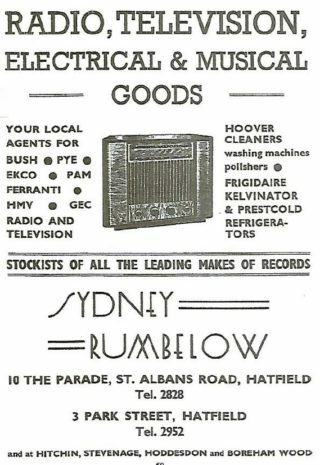 Whilst the chain of Sydney Rumbelow shops became absorbed into the larger group in the first half of the 1960s, it is significant that the name Rumbelow became even more dominant in High Streets throughout the country as Thorn chose to use the Rumbelow name for its whole range of electrical retail outlets in 1969. And so it remained until 1995 when, due to the pressure of increased competition, particularly from out-of-town superstores selling an even wider range of goods, the group decided to close its 285 branches with inevitable loss of considerable number of jobs. One final observation regarding Sydney Rumbelow was revealed when doing this research. At the time of his birth his name is shown as Sidney but by the time of his marriage the “i” had become “y”. Was this merely an error on the part of the Registrar of Births or was it a deliberate change made as his career developed to make the name more distinctive in the eyes of the public? This page was added on 20/03/2017. Can anyone enlighten me on the connection with Elliott’s in Chequer Street, St. Albans? My grandfather owned the Elliott string of shops and did sellout to a bigger conglomerate as did my father, his son, Philip Taylor who owned the TV shop at 1 London Road, St. Albans in the 60’s/70’s. I used to work a the White Lion branch early ’70s as delivery driver, installing TVs & washing machines etc. One of my 1st jobs after leaving school. I can even remember the reg no. of the van VUL 79G! the manager was Roger (who later moved to the Luton branch, Doreen the record sales girl & Alan the salesman. I would helpout as salesman on Saturdays being our busiest day. Colour TVs were becoming increasingly popular our best sellers were; HMV, Ultra & Fergusson all made by Thorn, same chassis, different cabinets. I can’t remember how much but very expensive for the time. I do remember that a basic Indesit automatic washing machine was £59. I would also dep as driver at the WGC branch, as & when, as their driver only worked part time. 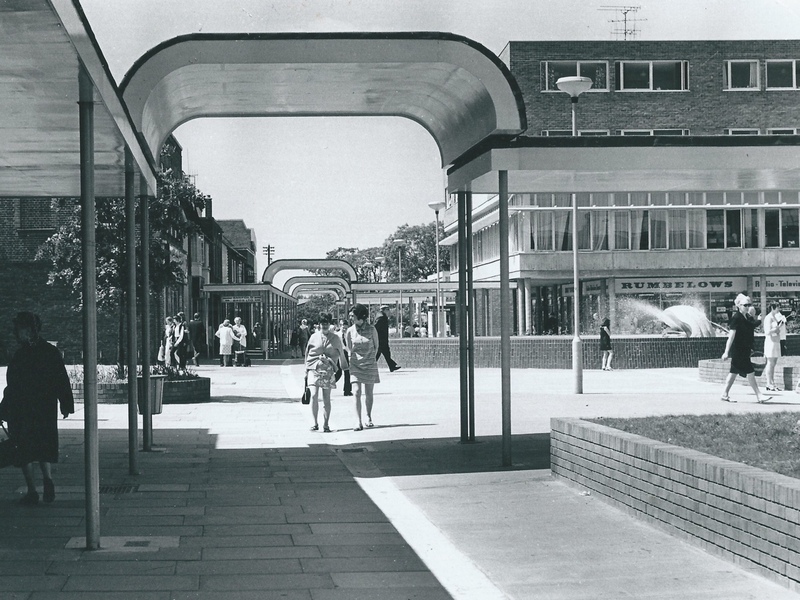 The WGC branch wasn’t as busy as Hatfield, bearing in mind Welwyn dept. store had both large electrical & record depts. I remember Rumbelows very well. We bought all our electrical goods from there, radio’s, t.v.’s etc. in the 1950’s and 1960’s. I used to browse the huge records collection on Saturday mornings.